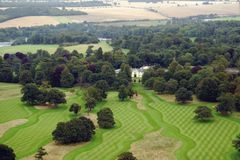 Luton Hoo is a newly established luxury golf, spa and leisure resort which is ideally placed for an escape from London. Spread across the historic estate grounds, designed originally by the esteemed landscaper Capability Brown, is a fantastic championship golf course. The original mansion house dominates the skyline of the 1,000 acre Luton Hoo estate, and is home to the most lavish of the accommodations, including 5 state rooms previously reserved for visiting dignitaries. These opulent offerings are supplemented by three further accommodation options. Take advantage of 25% off buggys at the resort. Located on the border of Hertfordshire and Bedfordshire, Luton Hoo’s 7,107 yard Championship golf course, has recently hosted Jamega Tour, EuroPro Tour and European Challenge Tour events. Golf at Luton Hoo offers some picturesque, if not testing tee shots, featuring 6 holes with water hazards. The course offers a formidable test of course management to the accomplished golfer, while remaining an enjoyable challenge for the less experienced player. The Grade 1 listed mansion house at Luton Hoo has played host to royalty and dignitaries over the centuries. Painstakingly restored to its former glory, the property stands proudly within magnificent grounds. Boasting over 1,000 acres of parklands designed by the celebrated landscape architect ‘Capability Brown’, the estate comprises formal gardens, woodland trails, 50-acre lake, all-weather and Victorian lawn tennis courts, as well as an 18-hole, par 73 golf course. Located in the Robert Adam’s former stables, the Spa a range of products from ESPA to provide relaxation and calm for all guests. The opulent bedrooms and suites are all beautifully furnished, have individual character and come well equipped; the state suites in the mansion are particularly impressive, all with outstanding views across the immaculate estate. Exquisite fine dining is offered in the Wernher Restaurant with rich furnishings and tapestries setting the mood, while the Adam’s Brasserie provides a less formal dining option. At the foot of the estate, on the banks of the river Lea, the Warren Weir Suite offers the luxury of exclusive use for meetings, events and weddings. Ideally situated, the hotel is just 10 minutes’ drive from London Luton Airport and have excellent links to the M1 and M25. Q - What is the fee for the caddies?